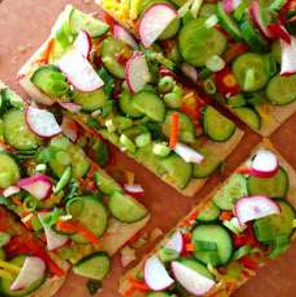 A naan that doubles up as pizza – that’s exactly what this Veggie-Naan Pizza recipe delivers. What’s more, it’s really easy and quick to make and only needs a handful of ingredients. Try this out for a yummy snack for kids as well as friends. It’s perfect as a side dish at informal parties as well. Toast the naan or the bread you’re using until it becomes crispy and stiff enough to serve as the base for toppings. Spread the pizza sauce or hummus over it. Follow with generous portions of vegetables. Sprinkle crumbled cheese on top. Bake the veggie-naan pizza for a couple of minutes to melt and set the cheese. Serve hot!